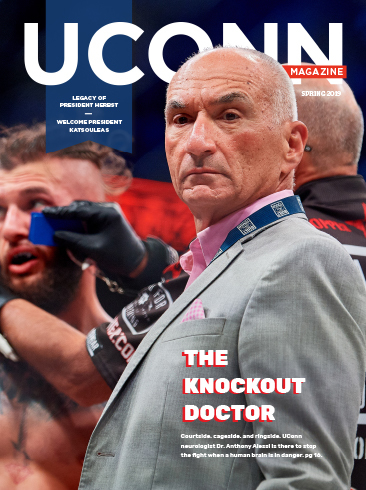 UConn Magazine is produced in print three times a year, in spring, summer, and fall by the Office of University Communications at the University of Connecticut. It is distributed to about 200,000 alumni and friends of the University. Our alumni magazine strives to inspire pride in our institution, encourage dialogue on a variety of issues, and present diverse viewpoints and stories highlighting our alumni, faculty, and students. Have a question about the magazine? Want to offer us feedback? We maintain a deep well of potential story ideas throughout the year. Please feel free to submit your story ideas for consideration by emailing our staff at lisa.stiepock@uconn.edu. We will contact you, should we have an interest in pursuing more information regarding your story pitch. UConn Magazine welcomes letters to the editor at lisa.stiepock@uconn.edu. Letters to the editor must include your name and class year(s), and should not run beyond 300 words. Letters are included on the magazine site at the editor’s discretion and may be edited for style, grammar, typographical errors, content, and length. We’d love to know what you’re up to. Submit information on the milestones in your life by email at alumni-news@UConnAlumni.com, online at UConnAlumni.com/newsandnotes, or by mail to Alumni News & Notes, UConn Alumni, 2384 Alumni Drive, Unit 3053, Storrs, CT 06269. Be sure to include your school and graduation year.